A puzzle game where you have to sneak and run your way past the elephantoid aliens! Thanks for trying it. Was there any where in particular you got stuck? That should be a lose situation anyway, but I agree its not really clear, and you certainly wouldn't open the door if you knew you'd get eaten! I'll have a think about how to improve it. Thanks. Yes, i'm very tempted to do a few more levels. There are a few behaviours of the aliens i'd like to explore! 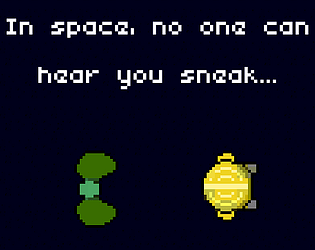 I liked how the footsteps/alien interaction was implented and how they go to where they last heard the sound. Tricking them makes me feel so clever. Well done. The last level had me panicking! Very good game. I wish there were more levels. Thanks - more levels was one of the things left on my todo list! Thanks for the comment. 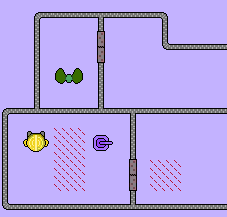 It sounds like my first level might be a little too hard for level 1 - it's doable though - carefully (don't hold down the move key), move through the gap in the red tiles and stay off the dark red tiles until the corridor. Yes - I think i'm going to try to update in the next couple of weeks with a few more levels and hopefully improve the difficulty gradient.